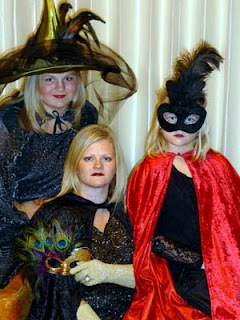 It seems that the world is divided into two groups of people: those who love Halloween and those who hate it. Now, these two groups can be divided into further sub-categories like those who like to “glam it up” and those who like to costume themselves as tins of ham (you know who you are), but I want to concentrate on the latter group of Halloween haters. I suspect that those with Samhainophobia(fear of Halloween) have experienced traumatic Halloween-related events in their past. It may have been a premature exposure to a haunted house, an older sibling with a propensity for jumping around corners wielding rubber steak knives, or the mistaken idea that gory equals scary. May I recommend a course of treatment? Visit a graveyard at night, and bring a child. No, this isn’t shock therapy. This is an exercise in tapping into the imagination, creativity and sense of fun that makes Halloween a treat rather than a terror. The children’s parents had settled into my living room with food and drink and had no intention of going anywhere until they’d had some serious “adult-time,” so I distributed lighted lanterns to the oldest children in the group and we set off. The graveyard tour was, without a doubt, the hit of the party. The participants ranged in age from 6 to 13. As we crossed the street, the littlest one holding my hand informed me that he was not afraid of ghosts because he knew “they were just pretend.” With this healthy attitude, the children had a riotous time running from tombstone to tombstone, searching for their own names and trying to find the oldest dates. The Pleasant Grove graveyard is a pioneer graveyard, which means it has inhabitants dating back to the 1800’s. The children practiced their math skills by calculating how old each person had been when he or she died. They were particularly moved by the sight of the tiny tombstones with lambs on them because these were usually the graves of infants. Lest you think that I happened to be accompanied by a group of particularly macabre children, my friend and neighbor tried the same kind of adventure a few nights later with a new batch of children. The verdict was the same. Even the very young kids had a great time. 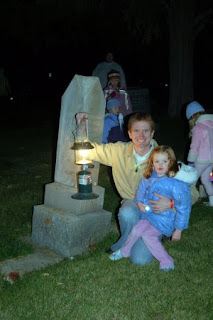 So here are a few tips for making your graveyard tour successful and safe. 1. Get children in the right frame of mind with age appropriate ghost stories. Some vintage children’s classics include “Georgie” by Robert Bright and “The Ghosts’ Trip to the Loch Ness” by Jacques Duquenney. 2. Remember that the children will take their cue from you. If you are excited and cheerful about your graveyard visit, odds are your children will be too. When they see that you are not afraid, they know there’s nothing to be afraid of. 3. Take lanterns and flashlights. While flashlights are convenient, a lantern is a lot more poetic. 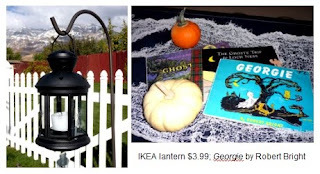 I recommend the inexpensive “Rotera” tea light lantern from IKEA for $3.99. 4. Be prepared with some interesting graveyard facts. For example, in the 1800’s, when someone died from an illness, they were often buried with a string tied to their finger which was attached to a bell above ground next to the grave. That way, if the person had accidentally been buried alive, the unfortunate soul could yank on the string and ring the bell, signaling people above ground that they needed to be dug up. 5. This kind of activity seems to work well in groups. Children feed off of each other’s enthusiasm and give each other courage. 6. Dress in light colors. It’s much easier to see each other this way.